We have come to the point for me to reveal my positional rankings for the upcoming NFL draft. I will put out my top ten (plus) with two positional groups coming every week leading up to April 25th, with my top 100 big board and only mock draft finishing up the process. This week I am starting with the running backs and linebackers. While there is no generational running back prospect such as Saquon Barkley in this class, I think overall these skill positions are very deep this year. You will see something similar with the wide receivers, where there is no consensus number one guy, but plenty of prospects NFL front offices will try to get their hands on. When it comes to the RBs, I think one young man has crystallized himself as the cream of the crop, but my rankings look a lot different compared to others after that. Obviously, these boards will alter depending on scheme fits and personal preferences, but for me, I am looking for an all-around back with vision, appropriate footwork, natural running style, versatility and the ability to create more than what is actually there. Check back in later this week and all the way leading up to the upcoming draft for more positional rankings and other material. Snell truly was a workhorse for the Wildcats, but more importantly, he was the heart and soul of that entire team while he was there, on his way to becoming Kentucky’s all-time leading rusher in just three seasons, as he went for almost 4000 yards and 48 touchdowns on the ground. He is an incredibly violent runner at 225 pounds with a compact build. Snell runs with a strong, low center of gravity and he packs a mean stiff-arm. Arm tackles will never work with this guy getting some steam, as you see defenders torque his pads while trying to bring Snell down and he just shrugs them off. It seems like Snell crushes collarbones every time he and a tackler lower their shoulders, as the runner loads up his forearm and rips it upwards to shrug the tackler off. He improved his agility going into 2018 and doesn’t mind hurdling an opponent either. Snell has excellent vision for peaking defensive linemen and the leverage on defenders at the second level, which he can take advantage of by cutting the other way and he has a good enough jump-cut to the outside to bounce a run that a defense is loading up inside to stop. Snell stands in strong as a pass protector and was used a lead-blocker on draw and pure ISO plays for his quarterback as well. However, he ducks his head on too many occasions and tends to shift his weight incorrectly. While he has improved his catch numbers a little every year, he combined for just 29 career receptions, which mostly came on check-downs. That leaves me with questions about his ability to be a part of a passing game open. The one big concern I have with the hard-nosed runner is the stiffness of his hips, as I feel like he fails to avoid contact by bending runs at times and combine that with the appropriate footwork. He also lacks some patience to allow the blocking to get set up in favor of just running into the backs of his offensive linemen. Snell reminds me a little bit of a young Marshawn Lynch when I look at his style of play and the personality he brings to the table. He ran all over strong defenses in Mississippi State and Penn State last year on his way to picking up 81 first downs and gaining over 800 yards after contact. Even though the Irish already had a strong rushing attack with the offensive line pushing people backwards, Williams’ explosiveness took that to a different level when he returned from a four-year suspension in 2018. He went for just under 1000 yards and 12 touchdowns in nine games, giving him an average of 6.3 yards a carry. The 5’11”, 215-pounder had his first touch this past season result in a 45-yard score versus Stanford, as you saw how quickly he can go the distance when he has some daylight – and he doesn’t need a lot of it. Williams operates very well in tight quarters, sorting his through trash while putting his off-hand on the backs of his offensive linemen while complementing that with the appropriate footwork. When he shoots through an opening, he dips the shoulder to avoid contact with a defender reaching out. The Irish back is an expert at side-stepping behind blocks in order to create a running lane for himself. Williams has excellent fluidity in his hips, not having to waist any steps when cutting upfield and basically being able to change directions by about 150 degrees in one motion, plus once he does decide to turn it back he has the speed kill get to the sideline before someone can get an angle on him. Williams looks and runs bigger than he actually measures and when he has momentum it is tough to slow him down, as he breaks a ton of tackles when a defender on the edge doesn’t get his head across on the tackle and the running back can pull his legs out of the reaching arms. With that being said, Williams needs to do a better job protecting the ball when he is swarmed by defenders instead of trying to reach out or these NFL defenders will knock it out of his hands at a much higher rate. He doesn’t really push the pile but instead tries to escape and loses yards in the process. The former Irish RB is a willing pass-protector but gets overpowered on some occasions. Williams was probably the best running back all Senior Bowl week, showing a lot of burst and peripheral vision for cutback opportunities while carrying it all the way to the endzone on every single rep to go with that home-run mentality. Williams also caught the ball pretty well in practice down in Mobile, after all of his 16 catches came at or behind the line of scrimmage last season. It took Anderson a while to get going and take over the starting role for Oklahoma in 2017, but once he received more than ten touches per game from week seven one, he averaged 166.6 yards and two touchdowns from scrimmage, totalling 1343 yards through the final seven weeks. He really started looking more and more like a young Beastmode, running with tremendous power and contact balance and he seemed to get stronger towards the end of the season, but also it is his unique running style that gives me flashes of Marshawn Lynch. While it doesn’t quite look the same, Anderson is also a guy who uses different stride length and subtle changes of direction to rumble through defenses. That entire stretch was highlighted by a 200-yard rushing performance versus Georgia in the Rose Bowl. While he started off smoking hot in 2018’s season-opener against FAU, going for 100 yards and two scores on just five carries, Anderson was lost for the season early on against UCLA the week after. At 6’1”, 220+ pounds, Anderson carries a thick and strong lower body. He runs through a multitude arm and ankle tackles, has good leg drive and people just bounce off him. Anderson runs with great forward lean and becomes a load to bring down, welcoming the contact and running through it. He has a good stiff-arm and uses it to just push off and move even faster at times. It has to be demoralizing for a defense when they have this guy all stacked up and somehow he still ultimately lands a couple of yards ahead of that point. For a guy his size, you wouldn’t think the bruising runner would blow anybody away with his acceleration and top-end speed, but you see him run away from pursuing defenders constantly and when somebody gets a hand on him along the sideline it doesn’t really slow him down. Anderson produced some big plays in the passing game, coming out of the backfield as well as split out in the slot. Oklahoma targeted him on wheel or seam routes and you saw excellent adjustments reaching around for the football, but he can also simply be a check-down option, run angle routes or different types of screens and make things happen in the open field. He is pro-active in protection and stays balanced towards the arriving blitzer. He plays a little top-heavy in that department and some NFL linebackers will take advantage of it, but that can be corrected with proper coaching. The biggest question mark surrounding the Oklahoma one-year wonder is his health going forward – a broken leg pretty much cost him all his freshman year, he had to sit out the entire 2016 season due to a fractured vertebra in training camp and when he had finally emerged as one of the top backs in the nation, he suffered a torn ACL last year. Therefore medical evaluations will be key to his draft position and the career he might have at the next level. If you have any more questions on the prospects mentioned or any other ones, just let me know in the comments or via mail and I can share my notes with you! The number one back in this class was just a three-star recruit coming out of Oklahoma. After recording 7.3 yards per offensive touch as a freshman, expectations for Jacobs were high in 2017, but he was limited to just 60 touches through 11 weeks. He later revealed that he had been dealing with a broken ankle since week five and had to undergo surgery on it. Last year when he was finally healthy his attempts rose throughout the season and he looked as explosive as ever, gaining almost 900 yards from scrimmage and reaching the end-zone 14 times despite just 140 offensive touches. Among a very strong running back trio, Jacobs was the prime big-play threat for the Crimson Tide. However, he is not the guy to finesse around defenders in space but rather he gets downfield and crushes defenders in his way at full speed. Versus Oklahoma in the Orange Bowl, he absolutely obliterated the last defender on his way for the touchdown and that guy actually had to be helped off the field. At 5’11”, 215 pounds there might have been no more punishing runner in the country than this dude. Jacobs plows ahead without any regard for tacklers around his legs or shoulder-pads and he trucked a multitude of guys on the Mississippi State defense. Not only does Jacobs load up the shoulder consistently going into contact, but he also rips that off-arm through to free himself. I have seen Jacobs completely shake guys as they break down in an attempt to tackle him. He can set up defenders with his speed to the edge and that cut right underneath them with one large jab-step. To do so you need a ton of hip mobility and control over your lower body and that guy has it. Jacobs also displays very sudden movements and can go from East-West to North-South in one step as he barely loses any speed. He can change up his footwork on the fly and hop-step to enable him to move wherever he needs to go. However, what I think is his best attribute is the quickness with which he can process information about the opposing defense and how blocking schemes are being set up. Alabama used Jacobs on those jet sweeps just like they did their wide receivers because of what he can do with that momentum, plus then they came back to use him as a decoy in that role. Jacobs lined up as a wildcat QB on several occasions as well and I don’t think he failed to convert any short-yardage situation like that all year long. The violent runner is also a smooth pass-catcher, who has no problem tracking the ball and reaching around the opposite shoulder late. He displays strong hands to hold onto catches through contact. With that being said, he doesn’t mind getting his hands dirty and blocks for his quarterback or fellow backs in the run game either. In pass pro, Jacobs is quick on his feet to slide across the formation and stay squared up to deliver a hit. Purely based off the work on tape, there is not much to critique about Jacobs, but there are questions considering his usage. While the lack of treatment on his tires is a plus, for the most part, he has yet to prove he can handle a large workload with his most touches coming last season at 140. Those nagging ankle problems will be something to monitor going into the pros. If there is one thing that really bothered me evaluating him if it that you see him lower his head too much in protection just like he does when finishing runs. Not only does he get off balance that way, but it is somewhat concerning for his health. 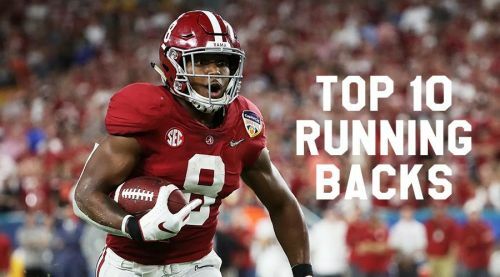 Even though there is very limited college production to back Jacobs up as the number one running back in this class, I am willing to bet my money on him, because I see all the traits necessary to be a tremendous weapon in the NFL. 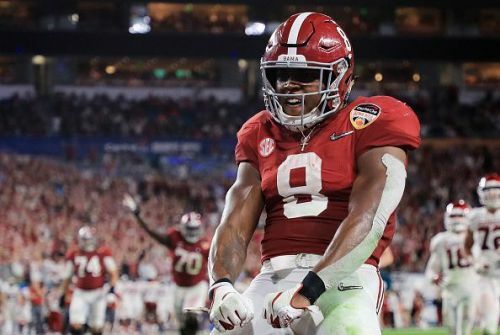 He simply is a very complete back, who can fit basically any run scheme and contribute on third downs in the pattern or protecting the passer, plus it almost seems like Jacobs gets stronger as the game goes along and he was great at putting teams away late in games for the Tide.